As the hours tick down and Cassini gathers data during our closest flyby yet of Enceladus I am thinking about the two Voyager flybys of the Saturn system that took place over 25 years ago. 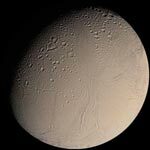 How in the world did we miss the Enceladus plumes back then??? In a nostalgic mood, I am looking over some of my old Voyager timelines today. (Yes, I actually kept all of my old timelines from each Voyager flyby)! I see that we took pictures of Enceladus during the first Voyager flyby in 1980, discovering a tiny, sparsely cratered world at the heart of the E ring. I remember wondering how such a tiny moon could create such a huge, tenuous ring. That mystery was one of the puzzles left for Cassini to solve. Remember that Cassini is in orbit around Saturn so we do multiple flybys, but the Voyagers only flew by Saturn, and each only had one encounter with Enceladus in their itinerary. < This view of Enceladus was taken by Voyager 2 in 1981. My timelines show that we planned to take more pictures of Enceladus during the Voyager flyby in 1981. Alas, the Voyager 2 scan platform containing the cameras and spectrometers stuck just as we flew close to Saturn, and the observation of our outbound pictures and spectra of Enceladus (and everything else!) were never made. I remember feeling sad about how much unique data we wouldn’t get on that fateful day and the days that followed. What discoveries remained for some other lucky scientists to make, I wondered? Little did I know that I would be one of those lucky scientists! Good thing Cassini is there to keep an eye on Enceladus! I’m glad you had this second chance; no reason to feel sad anymore!! This is one amazing mission; congratulations to all. True words and even more special is that one of the moons might have something like rings. There is still so much to discover there and around the other Giants (and Pluto).. I recently found an older danish book (the outer planets), that I remember reading as a kid, on a used book sale. Picked it up and is just as gittery about reading about the voyager probes adventure today as I was a kid. Apparently It was just the right timing to see your new discoveries from the Saturn system. Anyway just wanted to thank you for the great work you’ve been doing since the great voyagers and continue to do even today. do you have a timeline im doing something on you! “Thanks for Cassini info. I find it more interesting that universities across the country now have Kindle and Kindle DX units available for checkout, with Kindles pre-loaded with a selection of popular reading on a broad range of topics specific to the particular library from which they are checked out. Textbooks are next. Next Next post: Enceladus Data Back on Planet Earth!